German immigrant Adolf Gund founded the aptly named Gund corporation in 1898 and began producing top quality stuffed animals using the best available fabrics. For over 100 years, Gund stuffed animals have been setting industry standards in safety and manufacturing, and most importantly, making people happy. 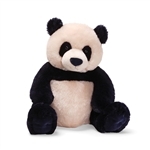 Gund's high quality plush animals are designed with originality, built with extreme quality, and embody the very spirit of a hug. When Adolf Gund retired, he sold his business on the condition that the high standards and principles of his company, along with the name, would always remain. This tradition of excellence has been carried on proudly through the years, with each new owner including the latest, Enesco, committing to uphold the quality and dignity of the Gund brand. Gund pioneered the production of licensed characters in the 1920's and 30's, at times producing plush Popeye, Mickey Mouse, and Felix the Cat dolls. Creating in-demand licensed stuffed animals is still an important part of Gund's business as they produce a full line of plush Sesame Street characters along with several other popular characters. Internet sensation Boo, the world's cutest dog, is another of Gund's highly popular ventures into the world of pop culture. Leading the way in the plush industry is simply second nature to Gund and crafting top of the line plush is the only thing that they know how to do. Their manufacturing process is so unique that it is actually trademarked. When you get a Gund stuffed animal you are getting an unparalleled level of quality and huggability. As their popular 1980's national marketing campaign states, you Gotta Getta Gund!